Alix really captures so much in this quote about Asperger’s and also about diversity as a whole. So often people ask me “Am I normal?” This question makes it seem like there is a desire to be like everyone else, to fit in or in some cases fade into the background. I say seems like because I don’t think this is the desire at all. I think the desire is for acceptance, to be different and it be ok. When I was planning this blog post with a colleague we thought that Autism awareness week was a great time to promote around the roadblocks that students with ASD might encounter while here at the university. It is still a great idea and we have resources to do this but it’s not the right one for now. Watching Alix’s Ted Talk I am reminded again of the inadequacies of society as a whole to meet individuals with ASD in their world. The roadblocks we put up in being able to access the minds of the visual thinkers, the pattern thinkers, the verbal thinkers and all other types of apparently “non normal” people. I watch daily people with ASD seek support to access the “normal” world. I watch them try and find ways to teach us what they see so clearly in their dreams and minds. I watch the ideas of the inner mind get lost in translation or between the gap between the brilliant mind and the lagging society norms. So what do we do? Alix suggests that the judgement needs to stop! I agree but I take it to the next step and say it has to go further, we have to stop assuming that this “normal” way is the right way, or the only way. We need to accept alternatives and embrace diversity more. We all need to take the step of closing the gap, it doesn’t have to sit like a burden atop the shoulders of every person identified as ASD. It is a shared responsibility. So next time you are in a conversation where the other person lacks tone, or gets stuck on a topic, doesn’t grasp what you are saying, misses your humor, appears to lack an inhibition button or lack what you consider an appropriate response to a situation step up and try and enter their world instead of blowing them off. This person may just be able to unlock the cure for cancer, have the key to solving world hunger, or maybe just maybe might be the helping hand that you need to growing your inner world beyond what you could have done by yourself. Check out Alix’s Ted Talk, she really is quite humorous! This app and website are like Meditation Gold! Yes there are so many different options to chose from not just in terms of the different guided meditations but also in language, and groups you can connect with. And it’s all FREE! Insight Timer is a free website and app that provide guided meditations across different topics like compassion, spirituality, depression and anxiety to name a few. You can use the timer, customise your playlist, chose scripts in different languages (25 languages are covered) and connect with a wider community of people also engaging in the same practice. It has over 4,300 guided meditations and music tracks from over a 1,000 teachers. You have the opportunity to join different groups and intereact with the members of that group through posts or just view the world map and see others meditating at the same time as you across the world. With a wide variety of influences and the meditations including, Buddhism, Judaism, Psychology, Shamanism, Sikhism, Vedic, Yoga, Hinduism, Christianity, Kabbalah, Scientific and Taoism there is sure to be something for everyone. What’s good about it: It is a one stop shop that has no barrier of language, culture or belief! What’s not so good about it: With all that choice it can seem a little daunting….I mean where do you start and how do you know what’s good. My tip is just explore but do it slowly. Start with one group or one practice and trial it for a week before adding or expanding your playlist. Before it starts to get busy this semester balancing assessment and exam commitments with work, friends and family get started on your skills to ride the storm by introducing the calming breath. The calming breath is achieved and valued in many cultural societies and spiritual traditions. From Buddhism and Hinduism to Chinese Confucianism to European Christianity; to indigenous animist and ancestor worship, the practice of meditation often includes the calming nature of breath awareness, reflection and prayer. A central theme strives for the art of being silent, receptive, empty, and attentive through meditation. Within the Western Psychology, meditation is often based in ‘Mindfulness’ a very popular practice derived from Buddhist traditions of being aware of the moment. Mindfulness is a form of ‘Open Monitoring’ meditation, such as found in Vipassna meditation or some forms Taoist meditation. Buddhist meditation, also includes some forms of Zazen, Loving Kindness Meditation, Chakra Meditation, Kundalini Meditation, Sound Meditation, Mantra Meditation, Pranayama, some forms of Qigong, and many others. These are ‘focused attention’ meditation. So too, within the Islamic traditions there is Salat (the ritual of cleansing and salutation) five times a day. There is also Dhirk, the silent and / or the vocal repetition of the names of God. And, Sufi orders use differing meditations related to love and the heart, a personal favourite of mine. Yes I am a lover of Rumi. Other Sufi paths also practice zikr; the use of music or twirling as a focused attention on Allah. Wondering what is available on campus around meditation then you could make inquiries with NUSA’s clubs and societies, check out the UON students event schedule, drop by counselling in the Student Services building or if you’re a postgrad student check out NUPSA‘s offerings on the Callaghan Campus. ** Marie is a Student Support Advisor located on the Sydney Campus. If you’re interested in an App around cultural diverse meditation scripts then Marie has also done a review that will be published tomorrow on a multilingual app. I am woman hear me roar…. I’m sure it hasn’t escaped anyone’s attention that this week we celebrated International Women’s Day. As a result my social media streams were filled with a range of posts both celebrating the power and strength of women but also highlighting the inequalities when compared to men in society. There were also posts highlighting the vulnerability of women with statistics of domestic violence rates and sexual assault incidences. What I loved about all these diverse posts is that they all came together and did one thing…. they spoke aloud of women. They made sure that no issue was left alone for fear of the stigma and shame associated with it. They all encouraged conversation about the great and not so great parts about being a woman in today’s world. They highlight the growth of our society. Compared to being a woman in the 50’s we have come a long way. We are no longer aiming to be the perfect housewife, instead we are aiming to be doctors, engineers, professional athletes and so many more professions. We have a long way still to come but this week we have been open about the good and the bad. We have not hidden the bad but shone a light on the path we have yet to travel. 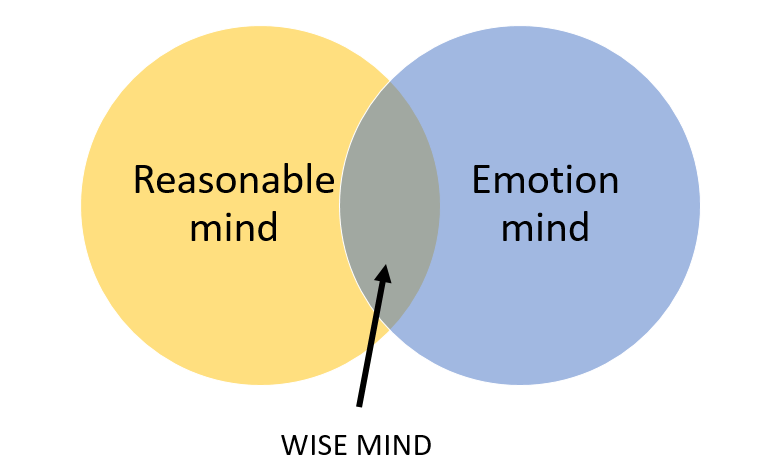 Mindfulness…merging your rational and emotive mind. Well it’s the calm before the storm that is known as final exams! It’s that time when you are trying to tap into your rational, task focused mind but your emotion mind is trying to hijack you so that you can’t concentrate. You’re trapped by the thoughts of failure, or thinking about past mistakes and wondering how on earth you are going to make it through the next 4 weeks. While there are no quick fixes to this and despite numerous research attempts we have not found the off switch for our emotions, we can use mindfulness to help you merge the two different spheres of your brain into one and try and maximise your wise mind experience. I know it’s great to be able to multi-task and pack as much into one day as possible but in terms of retention of information, synthesis and ability to recall it having individual focus is more important. So take time out this week to “smell the roses”. Practice you’re observation skills by taking 5 minutes to lie on the ground and watch the clouds go by. What do you see, hear, smell, and touch? Practice your description and unwrap yourself from the interpretations or the judgements you are making on situations by describing the facts. What? who? when? and where? Practice your participation by engaging in just one task at a time. Take the time to just listen to the music rather than listening whilst driving, or washing up. For more tips on being mindful and staying calm this end half of semester keep checking back on the blog as I’ll be giving regular small exercises you can try. You can also check out our additional resources in the tip sheets and topics of interest pages. So all that stands between you and freedom from assessments is completing the references at the end of your work, Argh! If you are anything like me I used to leave the job till the end. Partly because I didn’t want to spend time entering references I didn’t end up using and partly because, lets face it, it’s a crappy job. Fortunately a lot has changed now from my undergrad days and there are a lot of new online and applications available to help with referencing. One of these is the RefMe tool, available both online and as an app. This is a free tool that enables you to chose from over 30 referencing styles and you can either manually enter details, chose from the already listed resources or if using the phone or ipad you can scan the bar code of a book to assist with referencing. I always struggled with referencing electronic resources before and I decided to give this a go by entering in my own blog, sure enough it took the details from the URL and then converted them into a citation for me. It was easy to flick between referencing styles and also allows you to create different projects so you can keep different subjects in different lists. Like any referencing guide it isn’t perfect and there are some manual overrides needed but on the whole it isn’t too bad. It definitely beats the old days of looking up each referencing rule in my hard copy of the APA guidelines. What’s good about it: It is easy to create an account, it’s free and it doesn’t have any lengthy manuals to read before you start using it. What’s not so good: You will need to pay for the premium features and you may still need to do some manual overrides when you export the final page.